Wayne State University has been ranked among the top-tier higher education institutions in U.S. News & World Report’s 2018 Best National Universities ranking. The list includes the Best National Universities top-tier listing, composed of 300 institutions. 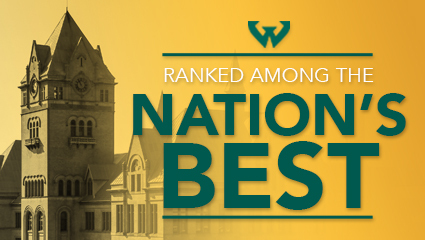 Wayne State shared the 223 ranking with seven other institutions. The rankings are based on several measures of quality. Scores for each measure are weighted to arrive at a final overall score. The numerical rank of the top 75 percent of schools, including Wayne State, are published; the remaining lowest-ranked schools are placed in a second tier based on their overall scores. The most heavily weighted factors in the rankings evaluation are graduation and retention rates, which are assessed at 22.5 percent. This measure has two components: six-year graduation rate and first-year retention rate. Assessment of excellence – 22.5 percent: These assessments allow presidents, provosts and deans of admission to account for qualitative attributes such as faculty dedication to teaching. Input also is received from public high school counselors. Faculty resources – 20 percent: Class size, faculty salary, proportion of professors with the highest degree in their field, student-faculty ratio and the proportion of faculty who are full time. Student selectivity – 12.5 percent: Admissions test scores for all enrollees who took the critical reading and math portions of the SAT and composite ACT score. Proportion of enrolled freshmen who graduated in the top 10 percent of their classes and the acceptance rate, or the ratio of students admitted to applicants. Financial resources – 10 percent: Measures financial resources by using the average spending per student on instruction, research, student services and related educational expenditures. Graduation rate performance – 7.5 percent: Effect of programs and policies on the graduation rate including spending per student, admissions selectivity, proportion of undergraduates receiving Pell grants, and — new this year for national universities only — the proportion of undergraduate degrees awarded in science, technology, engineering and mathematics disciplines. Alumni giving – 5 percent: Average percentage of living alumni with bachelor’s degrees who contributed to their school. To view the 2018 Best Colleges rankings, visit usnews.com/colleges.